Thomas and Friends is a television show in the Animated genre starring Michael Angelis, Ringo Starr, and George Carlin. The tv show first appeared on air on 1984-09-04. Our users found the overall impression of this television show to be Inspirational. The tv show's official site can be found at www.thomasandfriends.com. My son has loved trains ever since he saw them for the first time at Toys R' Us. Since then, I've been trying to find some good television programming for him to watch that would help encourage his passion for trains. Most of the programs on television nowadays don't involve trains like in the past. Luckily, I noticed my local children television network, Treehouse TV, was actually showing old episodes of Thomas the Tank Engine and Friends. I still remember watching that show when I was growing up so, naturally, I introduced my son to the show and he loves it. For those that don't know, Thomas is a Tank engine that uses his willpower to get through the most difficult situations. The show uses stop motion animation – which is primitive by today's standards of three dimensional animations and computer generated graphics – but it still holds up extremely well after all these years. My son loves all of the trains' facial expressions and how they communicate with each other. He has even begun collecting some of the Thomas toys (though I must admit, I find them to be fairly expensive compared to the toys based on other properties). Each episode always has an important lesson that can be learned which, again, is a lot different than the “time waster” shows on television today. Definitely introduce your child to this show if you get the chance. 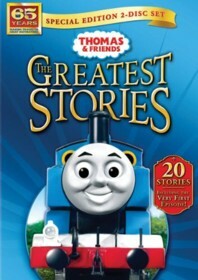 It might not be on tv anymore in your area but you can pick up dvd's of the show at most stores as Thomas appears to be gaining popularity again.